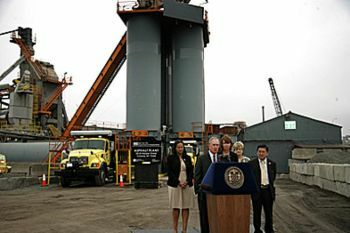 At the end of May, New York City Mayor Michael R. Bloomberg and Department of Transportation Commissioner Janette Sadik-Khan announced the start of operations at a new asphalt plant in Corona, Queens. The new plant – part of the city’s push for long-term sustainability, known as PLANYC – is expected to dramatically increase the city’s production and use of recycled asphalt pavement (RAP). This is good news for sustainable transportation folks. Once the plant reaches full operational capacity later this year, New York City will produce 75% of its asphalt (up from 50%), and its local production will eliminate two million miles of truck trips to haul asphalt into the city. This will cut down on congestion, pollution, and general wear-and-tear on New York’s roads.